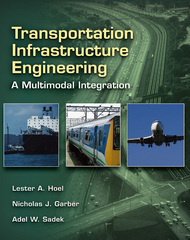 Transportation Infrastructure Engineering: A Multimodal Integration 1 Edition Transportation Infrastructure Engineering: A Multimodal Integration, intended to serve as a resource for courses in transportation engineering, emphasizes transportation in an overall systems perspective. It can serve as a textbook for an introductory course or for upper-level undergraduate and first-year graduate courses. This book, unlike the widely used textbook, Traffic and Highway Engineering, serves a different purpose and is intended for a broader audience. Its objective is to provide an overview of transportation from a multi-modal viewpoint rather than emphasizing a particular mode in great detail. By placing emphasis on explaining the environment in which transportation operates, this book presents the "big picture" to assist students in understanding why transportation systems operate as they do and the role they play in a global society.